Licensed Practical Nurses (LPNs) work under the direction of physicians, Registered Nurses (RNs) and other healthcare professionals to care for people who are sick, injured or disabled. If you are passionate about caring for others, enjoy working with people and are looking for a profession that capitalizes on these strengths, you could be well-suited to a rewarding career as a Practical Nurse. Is a Practical Nursing Career Right for You? Find Out! Take the "Prism Practical Nursing Career Readiness Quiz"
Practical Nurses work with individual clients to provide both physical care such as monitoring vital signs as well as emotional care, making sure that patients are comfortable. As an LPN, you may also be called upon to provide support to family members and to provide health education to groups. 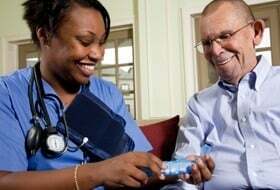 Experienced Practical Nurses may supervise nursing aides and may move into management positions. Successful graduates of the Prism Career Institute Practical Nursing program can feel confident as they attempt to transition from students into healthcare professionals after preparing in a clinical learning environment. I started classes at Prism Career Institute (Philadelphia Campus) for the Practical Nursing Diploma program on 4/2015. I was terrified, I had been out of school for over 20 years and felt I would not be able to keep up with the demand. I was enrolled by Matt, an enthusiastic enrollment specialist who ensured me that I could do it. Despite all the negativity I've heard about Prism, I have always been the type of individual who believes you get out what you put in. There were times I wanted to give up and quit but I kept on chucking. I had the BEST teachers and clinical instructors who cared about my success, making themselves readily available if I needed tutoring or just a listening ear. As of 8/2/16, I am a LPN and passed my NCLEX PN Boards on the first try!!!!! The best 15 months of my life. I highly recommend Prism to anyone who is looking to have a career and not just a job. The best way to see if Prism Career Institute is right for you is to contact an admissions representative. Get more information on our programs, class schedules, and financial aid options. Get more info now. The Pennsylvania State Board Of Nursing has conferred Provisional status for the Practical Nursing program at Prism Career Institute, Philadelphia campus. The New Jersey Board of Nursing has approved Prism Career Institute, Cherry Hill campus and Prism Career Institute, Egg Harbor campus, as certified New Jersey Board of Nursing accredited schools of Practical Nursing. Prism graduates that meet all State Board of Nursing requirements may be permitted to take the NCLEX-PN exam upon completion of all courses in the Prism Practical Nursing Program. Practical Nursing students who fail a course will not be allowed to progress to the following term until all failed courses are successfully completed. Students must also pass all courses to graduate from the program. Passing the NCLEX-PN exam is a requirement to become a Licensed Practical Nurse (LPN). To explore if becoming a Practical Nurse is right for you, complete the “I Want Answers” form on this page to receive career and program information, or call 1-888-966-8146 to speak with a knowledgeable Admissions Representative. For information about the other career programs offered at at Prism Career Institute, please visit our Program Page, or to see what programs are offered at a specific campus, visit our Campus Locations page or call us at 1-888-966-8146.